The third day of the second Test in Adelaide was, from an England perspective, one of the most disappointing I can remember seeing. In response to Australia's 570-9 declared, England were blown away, chiefly by Mitchell Johnson, for a paltry 172. By the time the hosts moved to 132-3, they had amassed a massive lead of 530 runs. Perhaps the saddest thing about it is that it was rather predictable, because England have lost all semblance of confidence with the bat. For that, you have to focus on Johnson, who is living out an incredible sporting story. "It's been pathetic, feeble - there is no way you can protect this batting today. England would have been blown away on day one if they'd batted like this. They are mentally shot. "Even when England lost 5-0 in 2006-07 I don't remember them folding like this. This is as bad as I have seen from an England side." Three years ago he was destroyed by England's batsmen, their supporters and the media to the point that his career was almost ended. Now, with 16 wickets in the series at an average of 8.93, he has made a phenomenal comeback and England have no idea how to play him. I really don't know how the tourists can gain some confidence against Johnson between now and the third Test in Perth. With that match starting on Friday, there is just no time. On his home ground, and probably the quickest pitch in the world, he will be in his element. For all Johnson's brilliance, you have to look at some of the ways England's batsmen got themselves out, particularly in the morning session. When you are battling to save a game, the last thing you do is contribute to your own downfall. Play positively, but without any degree of recklessness. Cross-batted shots are generally the ones that carry most danger, but all of Joe Root, Michael Carberry and Kevin Pietersen fell playing with a blade that was not straight. Root cross-batted a slog-sweep off Nathan Lyon to deep square leg and Carberry, though he played very well for his 60, pulled a short ball to square leg just before lunch. Some may be cross with me for criticising him, but the chances are that shot will not work in your favour. In between those dismissals, Pietersen plumbed the depths to provide the nadir of England's day, walking down the wicket at Peter Siddle to play his flamingo shot into the hands of one of two short mid-wickets. We know Pietersen can be brilliant, but we also know he is capable of these horrible moments. This was one of the worst. After that, the lower order simply did not fancy taking on Johnson and I can't blame them. Monty Panesar showed great bravery as he resisted for an hour, taking blows on the head and arms from an excessive number of bouncers that should have been halted by the umpires. Eventually, Panesar only lasted two balls when Johnson was recalled to the attack, but he had already done enough to embarrass and shame those ahead of him in the order. So what can England do? It is a question that will be playing on Andy Flower's mind. 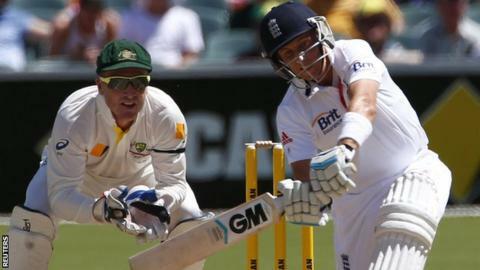 They can tinker with their side - Ian Bell could go to number three, Root back down to five. They may decide enough is enough for the out-of-form Matt Prior, while Panesar could keep his place ahead of Graeme Swann. However, England's problems are too deep for a change of personnel to solve. They are up against a motivated, determined, ruthless home side who are taking every chance that comes their way, while England, frankly, are a rabble. How can they get back to being the team they were only a few months ago? I'm not sure that they can. When things start running away from you on a tour like this, it is almost impossible to get them back. We built this day up to be pivotal in terms of the series and it is likely to be the case. Unless England produce something phenomenal or Johnson implodes with an injury, it is hard to see how this can be turned around. The Ashes may already be gone.